Looks can be deceiving, and when it comes to Grid Mania, what appears to be an inherently simple puzzle game is actually anything but. With an incredibly reasonable price point to boot, developer QubicGames’ latest Nintendo Switch title deserves a place on your system. 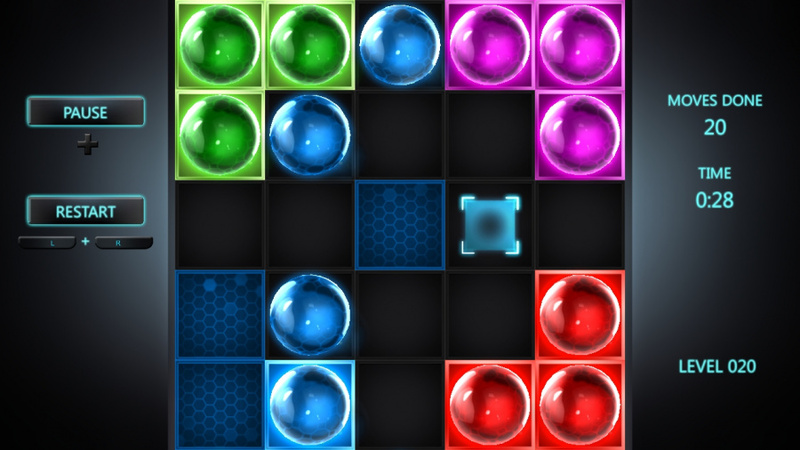 Played out on a 4x4 grid that can extend to 6x6 when things get more complex, Grid Mania tasks you with matching up coloured balls with their corresponding tiles. This is done by moving said balls up, down, left, or right, but the challenge comes from the fact that performing those actions will also move every other ball on the row or column you’ve selected in the same direction. Things start off fairly simple as you only have to worry about lining up red and blue balls, but with a set of green spheres quickly introduced and then purple ones after that, you’ll eventually be juggling up to four different colours. While what you’re doing is pretty straightforward, it’s a lot tougher than it seems. Just working out how to make every ball line up correctly is a task in itself, but the stakes are raised higher with the inclusion of squares that are blocked off, meaning you must take them into consideration when working how to get a specific ball into a certain spot. The trick to getting round them can be found in cycling a ball from one edge to the other as they loop back around (if you were to push one to the left when it’s starting position is on the left most side of the board), but if you haven’t lined things up correctly, this puts other spheres in danger. This all helps to create a genuinely challenging set of over 50 levels, and in turn a number of eureka moments as soon as you figure out the solution. Some of the most challenging puzzles took us well over 10 minutes to figure out, and with every move counted on the right-hand of the screen, our failures were being tracked in real-time. 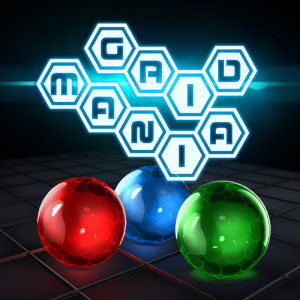 The idea at the heart of Grid Mania isn’t a new one, but the trappings of the overall experience are a ton of fun, engaging, and addictive as you promise yourself just one more brain teaser before bed. But this is only a quarter of the overall package. Three further game modes help to mix things up, as they all offer a different spin on the core gameplay loop. Quick Challenge follows the same format as the core level progression, but you’re given a limited number of moves to solve the puzzle in. Here, thinking ahead is the name of the game as you can very quickly burn all your turns and end up with an unsolved mess. Alongside that, Grid Madness puts an interesting twist on things where you’re actually doing the complete opposite of what the introductory mode asks of you. Lining up a sequence of three balls of the same colour will paint those tiles, and you must stain every square to progress. Finally, Chain Reaction tasks you with creating a string of balls while always keeping a firm footing on a corresponding coloured tile. With the four game modes combined, you’re looking at over 170 levels to complete alongside one more twist on the system that will randomly generate levels for you in the end-game. It’s genuinely impressive how much content QubicGames has managed to create out of a simple 6x6 grid, and thanks to every puzzle being a pleasure to solve, it remains incredibly enjoyable from open to close. The only real complaint we have is that the presentation is a little too bland. 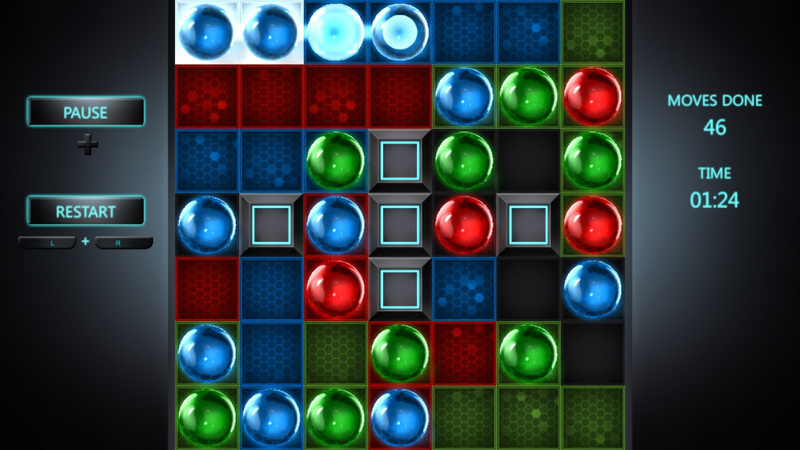 The balls themselves are a colourful delight, but the space around the grid is wasted with just a dull black background that does very little to excite. The electronic music adds a little bit of drama, but it can get a little too repetitive when you’ve been stuck on a certain puzzle for a while. 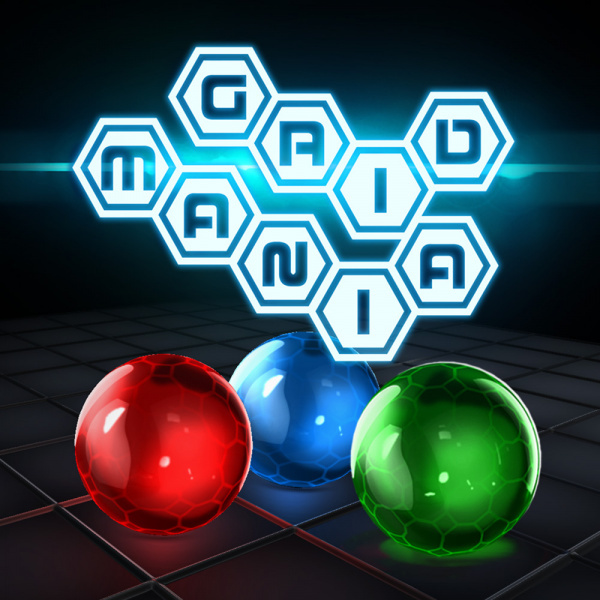 Grid Mania doesn’t attempt to revolutionise the puzzle genre in any shape of form, but the things that it does well help to create a solid brain teasing experience. The four game modes offer an excellent initial set of levels with escalating difficulty, and then three distinctive twists on that core mechanic that could all even warrant their own game. 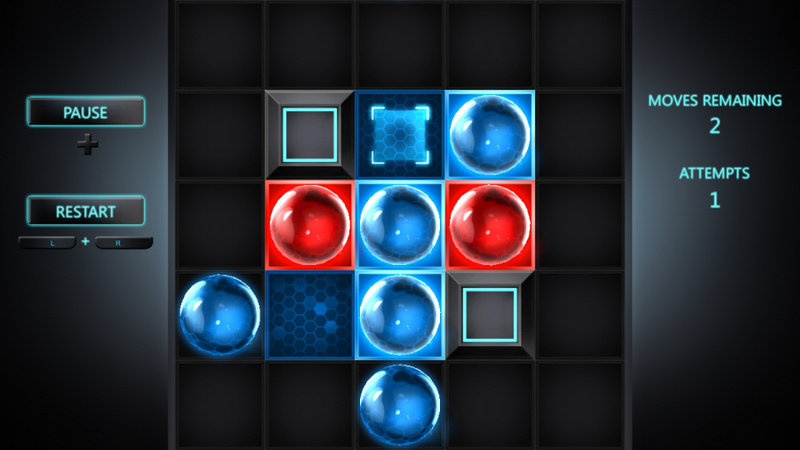 Presentational setbacks aside, Grid Mania is well worth your time if you want to feel like a genius. Nice one, I'll keep this in mind when I've got a few quid left on my account. So, about $4+tax for a 50 stage Rubiks cube concept? Awesome. It might be a bit too challenging for me, but at that price, & probable enjoyment (I'll get out of it), I'll definitely get this, if/when I get a NS. Not sure about this as I do get a bit frustrated with puzzle games sometimes. Might give it a try. Pretty good puzzle game. Like chain reaction and one were have fill grid with colour.